The Institute was founded in 1946 as the Ethnographic Institute of the Slovak Academy of Sciences and Arts. In 1994 it was renamed to the Institute of Ethnology of the Slovak Academy of Sciences and later in 2018 to the Institute of Ethnology and Social Anthropology the Slovak Academy of Sciences (SAS), and, today, it is one of the leading institutions in the field of ethnological and anthropological research in Slovakia. From the expert point of view, the Institute concentrates on the analysis of social relationships from the local and global perspective with a focus on the Slovak and Central European context. 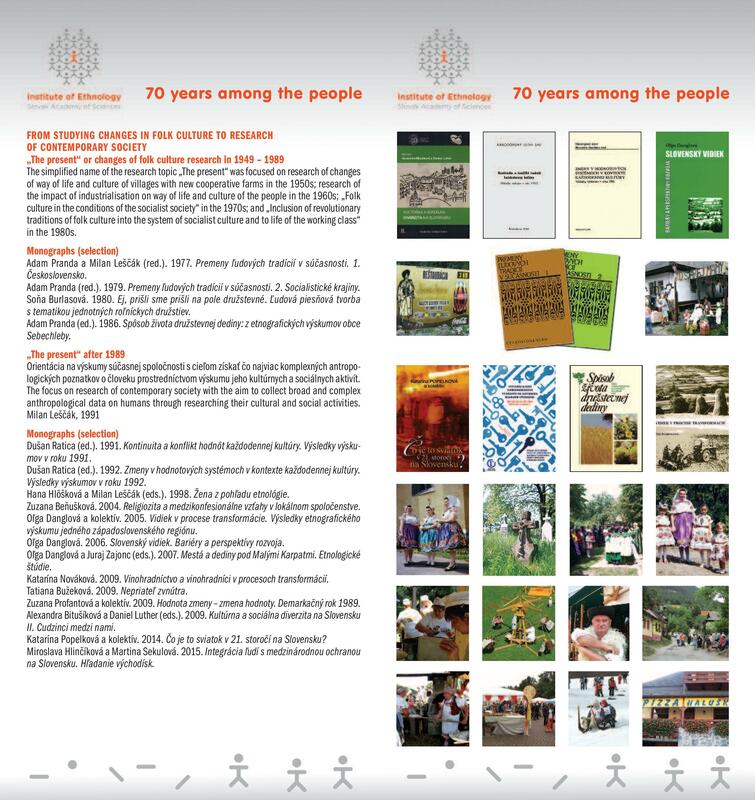 The fields of scientific interest include research on cultural traditions and ways of life, as well as social, cultural and material aspects of the economic and political transition after 1989 in rural and urban environments. Special emphasis is placed on phenomena of collective identities, memory, ethnicity, religion, minorities and migration, and cultural heritage. Our research projects apply current global theoretical and methodological trends and approaches. 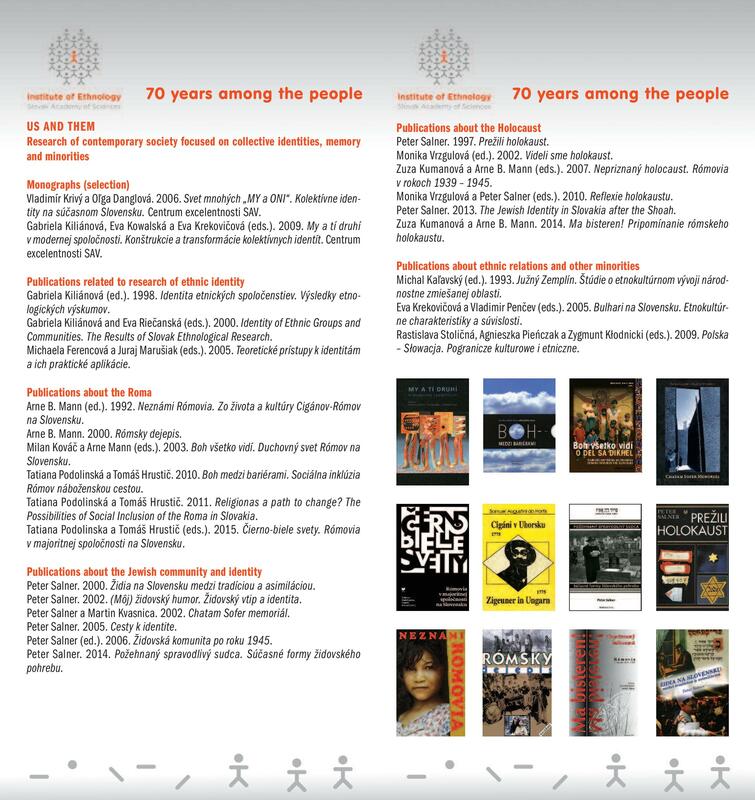 The Institute comprises an expert library and an information and documentation department with an extensive scientific archive containing text, picture and multi-media documents. 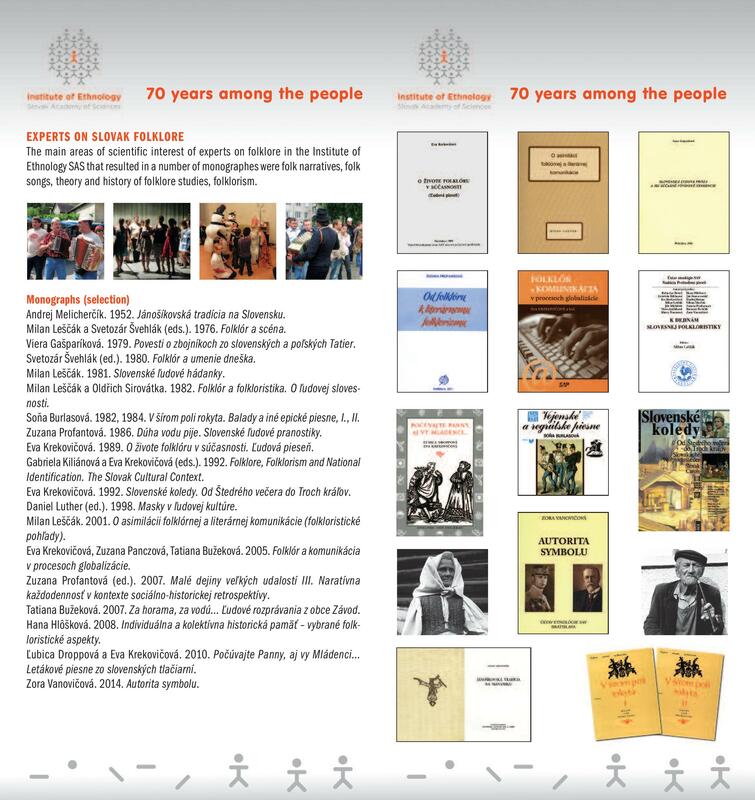 The Institute of Ethnology and Social Anthropology SAS houses the editorial office of the scientific journal Slovenský národopis/ Slovak Ethnology, and collaborates with the Ethnographic Society of Slovakia and the Slovak Society for the Study of Religions. The institute has long focused on problem-oriented research responding to current regional and global social topics and issues. International co-operation involves projects on socio-economic transition and structural social changes: current challenges and problems of families at the different stages of the life-cycle of their members, population ageing, poverty, inclusion of minorities, conspiracy theories, the Holocaust, religions in Slovakia in the late modern period, etc. 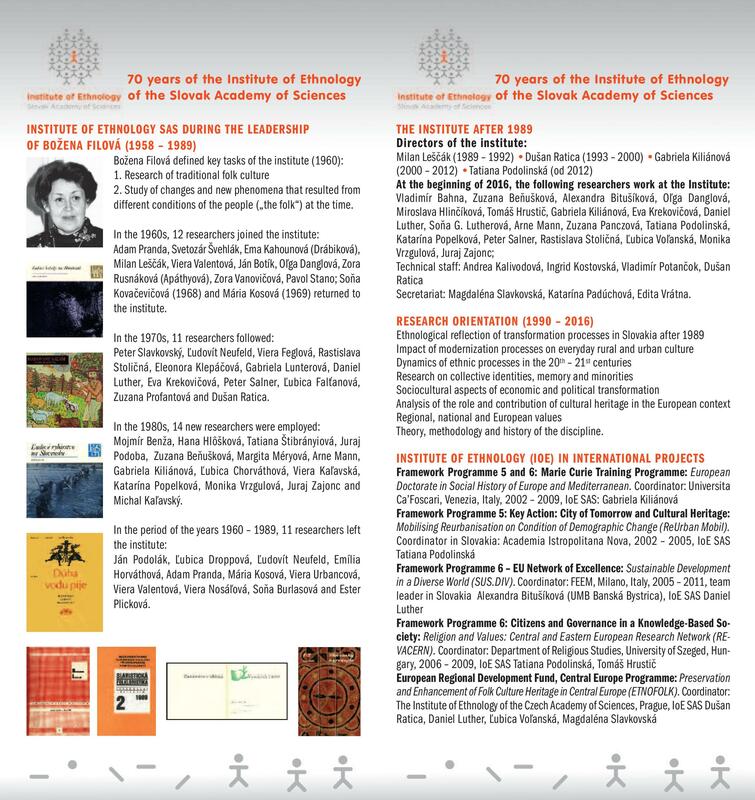 In 2002–2009, the Institute of Ethnology and Social Anthropology SAS was the research partner of two interconnected projects under the 5th Framework Programme of the European Union and the EU´s FP6 Marie Curie Training Programme – European Doctorate in Social History of Europe and Mediterranean (chief coordinator: Universita Ca’Foscari di Venezia, Italy), which set up a European network for the exchange of doctoral students. In 2002–2005, the IESA SAS participated through Tatiana Zachar Podolinská at the EU´s FP5 Mobilising Reurbanisation on Condition of Demographic Change; Key Action City of Tomorrow and Cultural Heritage (REURBAN MOBIL), and in 2007–2009 at the EU´s FP6 project Religion and Values: Central and Eastern European Research Network (REVACERN). In 2006–2010, the Institute was involved through Daniel Luther in the FP6 project Sustainability in a Glocalising World, Task Group 2.2 Cultural Distance, Organisations and Governance in a Glocal Context; SUS.DIV Network of Excellence (SUS.DIV). Through Michaela Ferencová, the Institute participated in 2009–2012 in the FP7 project Models and Their Effects on Development Paths: An Ethnographic and Comparative Approach to Knowledge Transmission and Livelihood Strategies (MEDEA). In 2011–2014, the IESA SAS acted as a research partner to the cultural heritage project Protection and Development of Heritage in Folk Culture in Central Europe (ETNOFOLK), supported by the European Regional Development Fund (ERDF). The IESA SAS is also involved in many multilateral and bilateral research and education projects. One of the recent ones has been the project Crimes against Civilian Populations during WW2: Victims, Witnesses, Collaborators and Perpetrators, coordinated by the Holocaust Memorial Museum in Washington (2011–2016) and with the participation of Monika Vrzgulová on behalf of the Institute. In 2015–2017, the Institute of Ethnology is one of the partners to the project InovEduc – Innovative Education Methods in Slovakia and Ukraine Using Augmented Reality. In 2009–2015, the IESA SAS participated in the international project for preservation of the world cultural heritage monuments of the Maya culture in Uaxactún, Guatemala, and in the ethnographic and socio-graphic mapping of the location since 2012 (the IESA SAS was involved in the project through Tatiana Zachar Podolinská). The Institute also participates in European programmes to support networks and mobility, specifically in COST actions (European Cooperation in Science and Technology): Ľubica Voľanská is Slovakia´s representative in the COST action Ageism – a Multi-National Interdisciplinary Perspective (2014–2018), and Zuzana Panczová is Slovakia´s representative in the action Comparative Analysis of Conspiracy Theories (2016–2020). 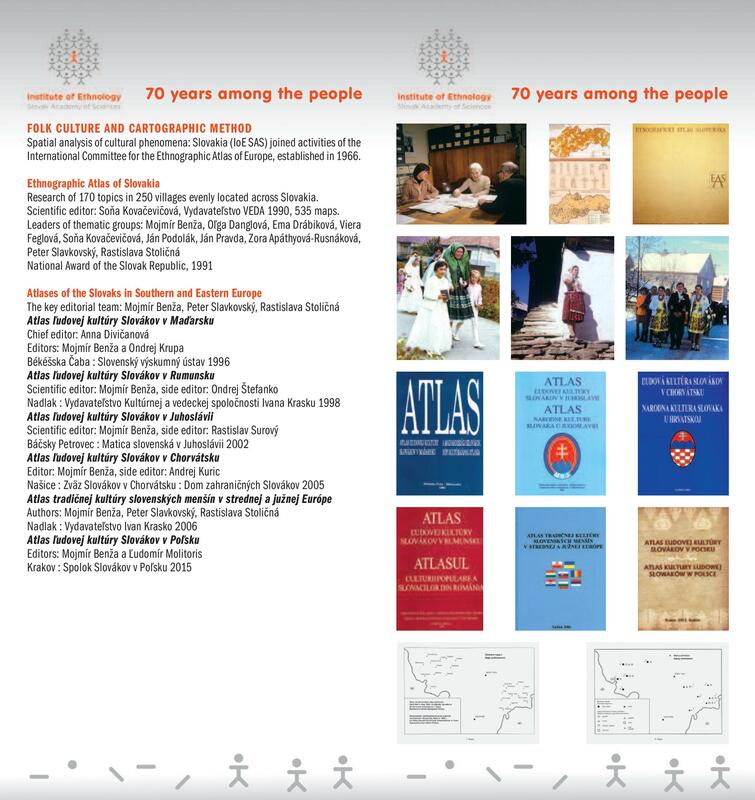 In 2015, the IESA SAS became the founding member of the European Network of Academic Institutions in Roma Studies (NAIRS) with 27 European collaborating institutions at present. In 2016, the IESA SAS organised the 1st NAIRS Summer School with the participation of 16 students and 5 invited lecturers. 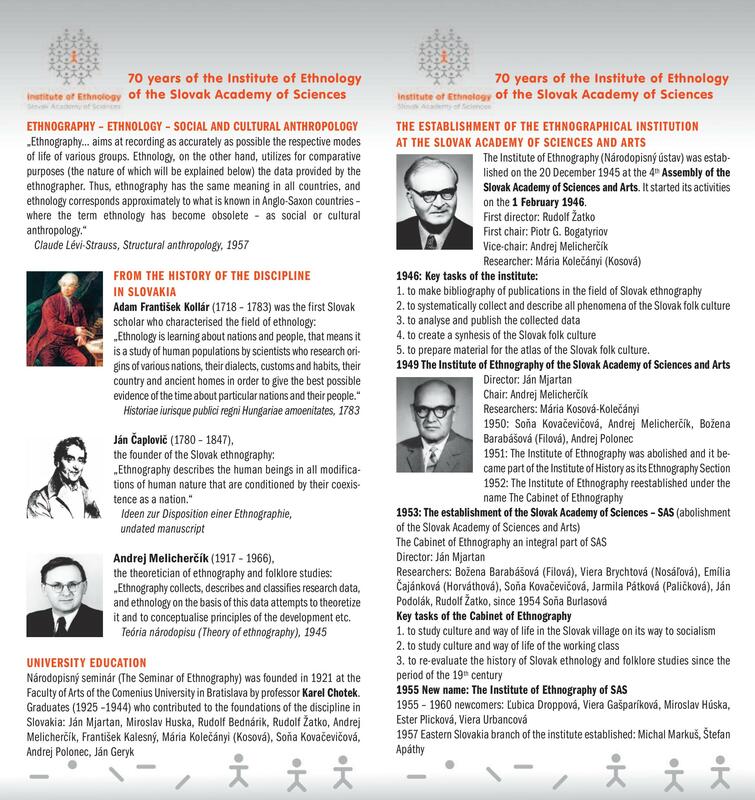 Since 2015, the IE SAS has been organising the Academy of Roma Studies in the framework of the Science and Technology Week in Slovakia. This academy has the form of 3-day open lectures by invited experts combined with a course of Roma language for the general and the expert public. For an overview of projects click HERE. The Institute of Ethnology SAS develops active co-operation with various external public administration and third-sector institutions and organisations. It is involved in applied projects focusing on the evaluation of local and state policies and the seeking of new creative solutions, civil society development and the integration of excluded social groups. 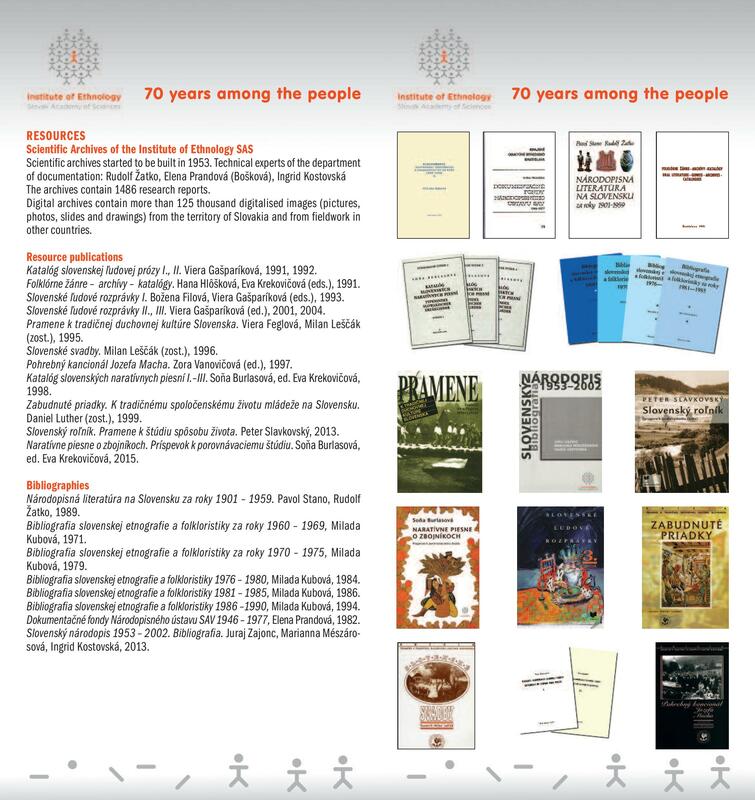 The most recent ones include the project of evaluation of field social work among Roma communities for the European Social Fund (2009–2010); innovative research of religious missions in Roma communities and their impacts on social change (SIRONA, 2010–2011); and the scholarship programme for secondary education of Roma through the Roma Education Fund (2012–2013). Other recent projects include co-operation with Milan Šimečka Foundation and the Holocaust Documentation Centre (e.g. project of education on racial hatred and the Holocaust for teachers), co-operation with the Public Affairs Institute (research projects on migration and migrants´ integration in Slovakia), and co-operation with the TransFúzia civic association (research of transgender children at elementary and secondary schools). 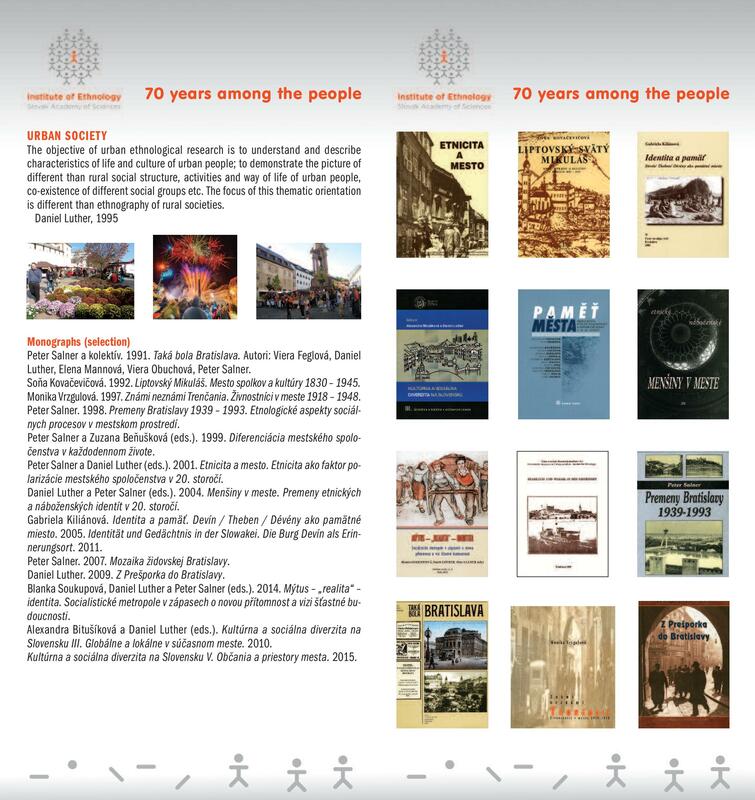 Our researchers are members of various advisory bodies of the Slovak government, UNESCO international committees for tangible and intangible heritage, and advisory committees of the European Commission. The researchers of the IE SAS are also involved in a wide range of popularisation projects and events (exhibitions, museum exhibitions, production of documentary films and videos, radio programmes, etc.). 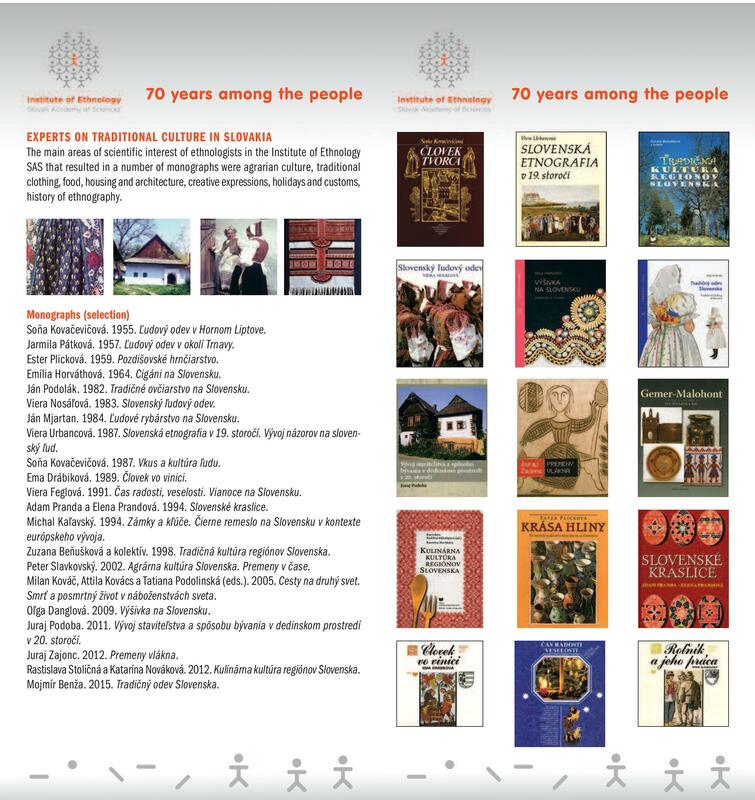 In collaboration with the Centre for Traditional Folk Culture at the Slovak Folk Art Ensemble, we prepared the electronic encyclopaedia of folk culture in 2010–2012 in the framework of the project Traditional Folk Culture of Slovakia in Words and Pictures. Annotation: Global and national challenges: addressing issues related to multi-ethnicity and migration (labour migrants and refugees). 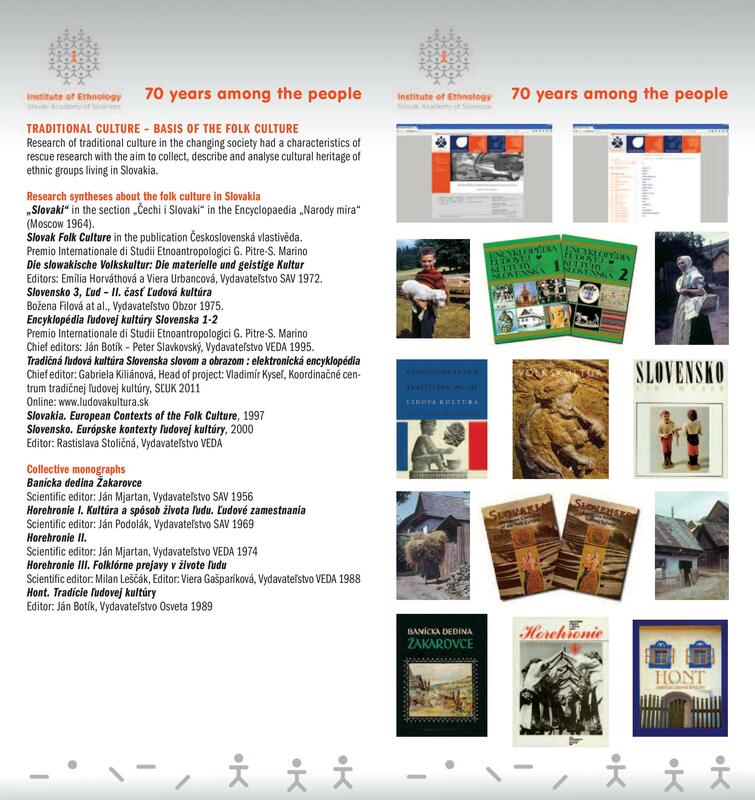 Annotation: Social groups in contemporary Slovak society: inter-generational communication about the past as a precondition for solving acute social problems; historical memory. Annotation: Research based on the oral history method, documenting the memories of Holocaust survivors. Annotation: Addressing the situation of economically excluded groups (poverty issues), ethnic, confessional, gender and age groups (ageing, young people´s chances) as a precondition of ensuring quality life and sustainable social and economic development of Slovakia. Annotation: Cultural heritage as a basis of creative and cultural industry, development of regions and tourism. Annotation: Social transformation after 1989 with a focus on urban environment; transformation of the urban environment with regard to various population groups (social, cultural and economic challenges of specific population groups, new social groups, changes in the age structure of the urban population), and urban environment (public space, suburbanisation). Annotation: Research on the current forms of religion, religiousness and spirituality, including no-religious and atheist phenomena. Should you be interested in co-operating with us, please, contact our researchers according to the chosen research topic.